During 1936, Pan Am and the four main U.S. domestic airlines engaged in talks with Douglas Aircraft Company regarding the development of an airliner designed to carry more than 60 passengers with a range of 1000 miles. The result was the DC-4E, the first large airliner to feature a nose wheel as well as a main landing gear. The first flight was in June 1938. Unfortunately, the aircraft design did not meet the requirements of all of the five airlines and as a result it was scrapped and attention was switched to a smaller airliner, the DC-4. The DC-4 initially went into production as a four-engine propeller-driven long-range commercial land plane. However, with the start of World War II, the focus switched to the military and the aircraft was re-designated the C-54 for the Army Air Corps and the R5D for the Navy. The first flight was on 14 February 1942 and eventually over 1000 were built. During the war nearly 80,000 ocean crossings were made including a 250-strong armada that delivered two Army divisions to Japan from Okinawa after the Japanese surrender. 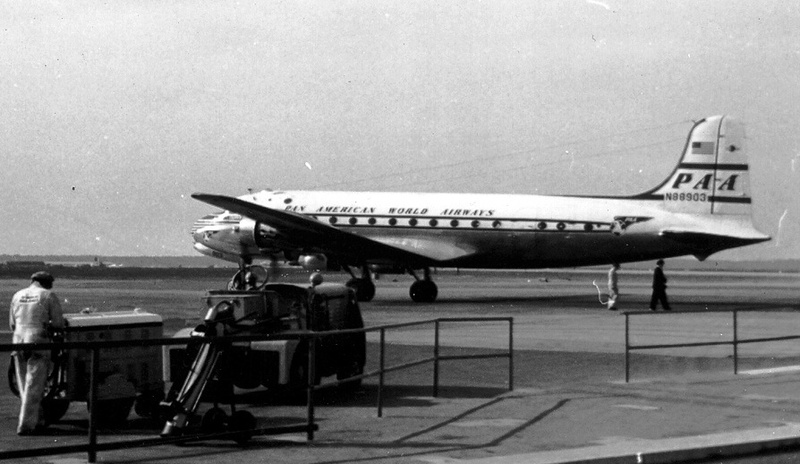 The DC-4 also had a prominent role in the Berlin Airlift. 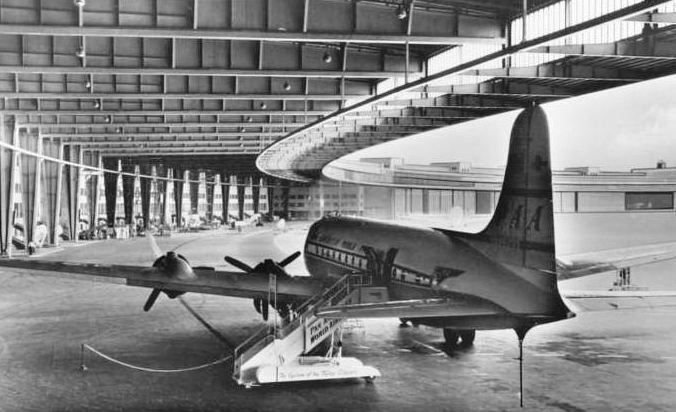 The aircraft proved to be a popular and reliable type, and its tricycle landing gear design allowed the fuselage structure to be stretched into the later DC-6 and DC-7 aircraft. Douglas continued production throughout the war and after. The aircraft was not pressurized, although it was an option. Besides the U.S. carriers, airlines from all over the world acquired the DC-4. Among the many were SAS, Iberia, Swissair, Air France, Sabena, KLM, Aerolineas Argentinas and South African Airways, as well as Pan Am affiliates Panagra, Cubana and Avianca. Clipper Westward Ho in “bare metal” color scheme. 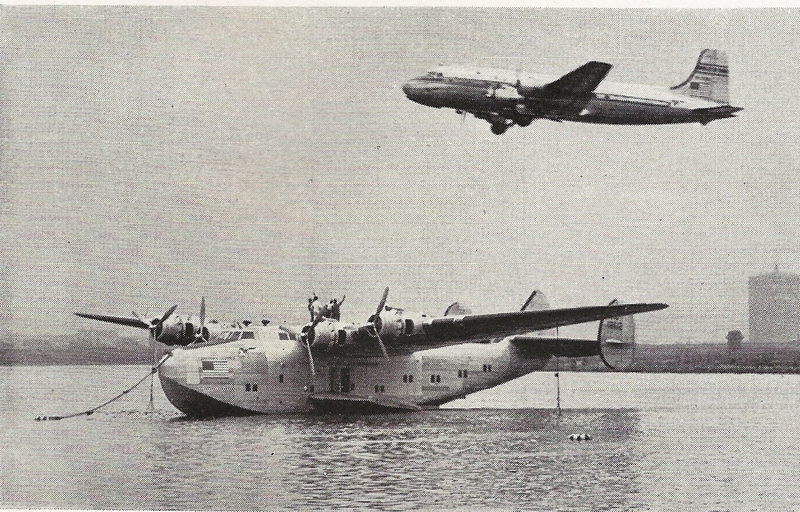 Pan Am eventually acquired over 90 DC-4s and employed them throughout its world-wide route system. It was also the aircraft used on 19 January 1946, when Pan Am operated the first landplane passenger flight to Africa with Clipper Lightfoot to Leopoldville, Belgian Congo. 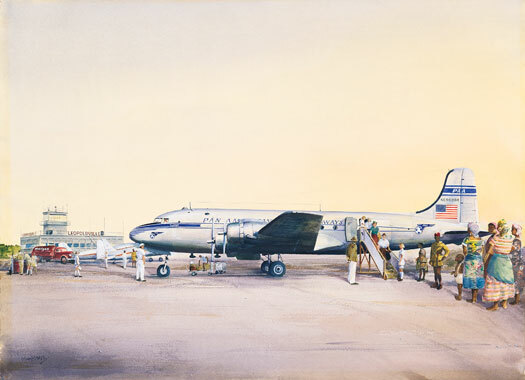 Pan Am’s use of the DC-4 from the end of the war until it was withdrawn in the early 1960s was initially extensive but became more specialized. A look at the timetables from that era tells the story. John T. McCoy watercolor of the inauguration of service to Africa. 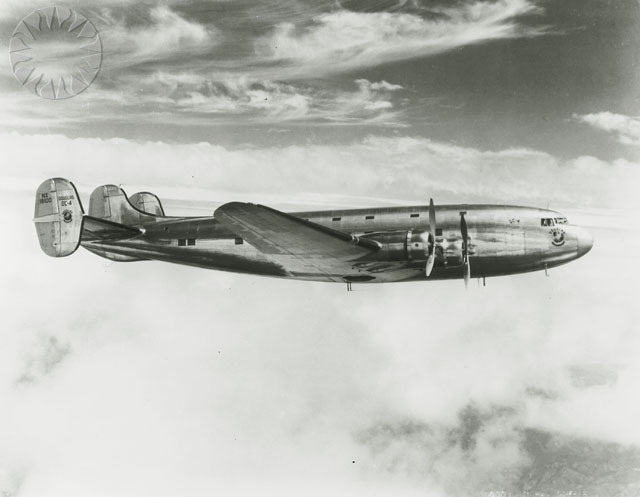 In the June 1948 timetable, the DC-4 was used on Pan Am’s round-the-world flights between Calcutta and California and saw service on European, Alaska and the Pacific routes. The aircraft was also used in Latin America, including on Pan Am’s signature flights 201/202 between New York and Rio de Janeiro. 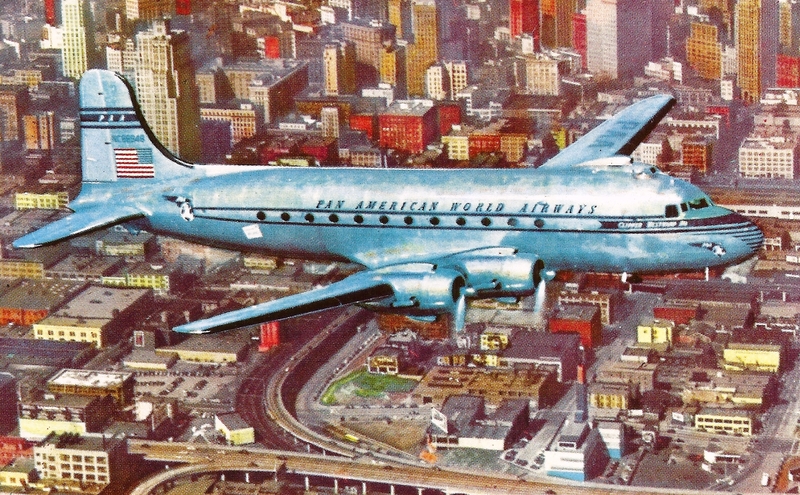 By the April 1952 timetable, Pan Am had introduced the DC-6B and the DC-4 was used more sparingly. In Europe it was used primarily on the Internal German Services (IGS) and in the Pacific it operated for the most part between Tokyo, Manila, Hong Kong and Singapore. 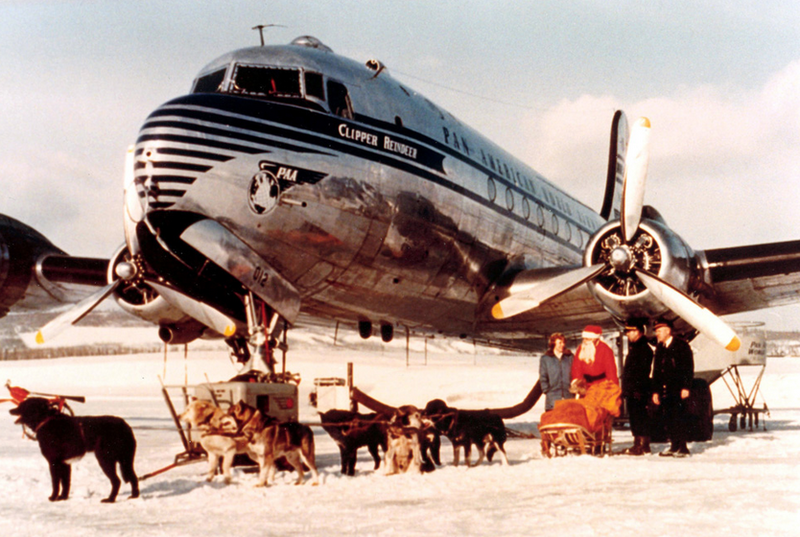 The aircraft was also used in the Alaska service, Bermuda service and for Tourist class service between New York and San Juan and Miami and Havana. By the April 1956 timetable, the DC-7B and DC-7C had been introduced to Pan Am’s fleet and the DC-4’s operations became more and more specialized. For example, the aircraft was employed exclusively on the IGS, with limited service on the Alaska and Pacific routes, and in Latin America with Avianca flights out of Bogota, Colombia. By the April 1959 timetable, jet service had been introduced. The DC-4s were still employed in the IGS and with very limited service in the Pacific, and also with Panagra in Latin America. And in the September 1961 timetable, with minor exceptions, Pan Am’s DC-4 passenger service ended when the DC-6B replaced the venerable aircraft on the IGS. 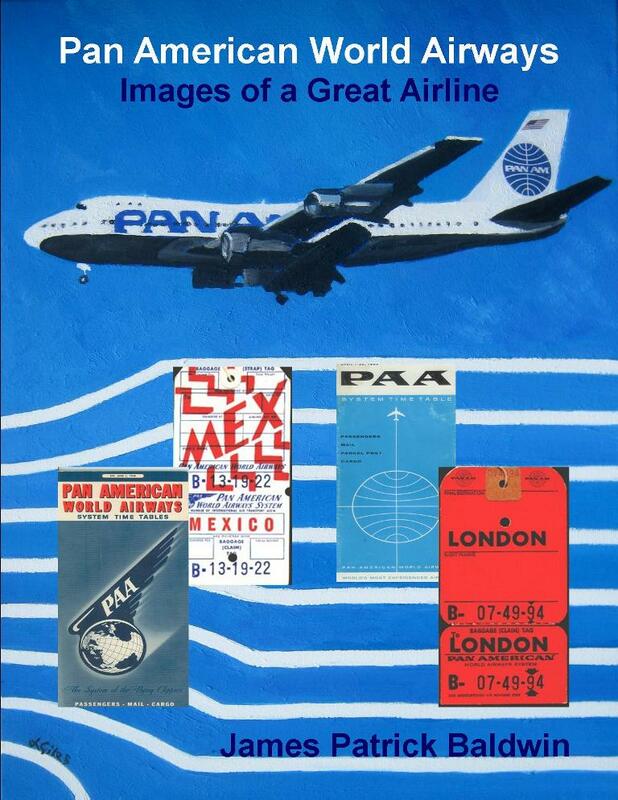 For a timeline of Pan Am “firsts” and significant historical events with images of aircraft, timetables and other memorabilia, see a preview of the book Pan American World Airways – Images of a Great Airline. The book is available directly from the publisher, BlueWaterPress or from Amazon.